Heat oven to 400°F. Grease cookie sheets with shortening. In medium saucepan, heat water and 1/2 cup butter to boiling over medium heat. Stir in flour and salt; cook, stirring constantly, until mixture leaves side of pan in smooth ball. Remove from heat. Beat in 1 egg at a time until mixture is smooth and glossy. DO NOT OVERBEAT. Spoon 12 mounds of dough (about 1/4 cup each) 3 inches apart onto cookie sheet. Bake 30 to 35 minutes or until golden brown. Prick puffs with sharp knife to allow steam to escape. Remove from cookie sheets; cool completely. To make sauce, in medium saucepan, melt 1/2 cup butter. Stir in brown sugar and corn syrup. Heat to boiling; boil 1 minute, stirring constantly. Gradually stir in whipping cream; return to boiling. Remove from heat. Stir in pecans. Keep warm. To serve, place each puff on serving plate; slice in half horizontally. Spoon about 1/3 cup ice cream into bottom half of puff. Replace top half of puff; drizzle with sauce. *To toast pecans, bake uncovered in ungreased shallow pan in 350°F oven 6 to 10 minutes, stirring occasionally, until light brown. 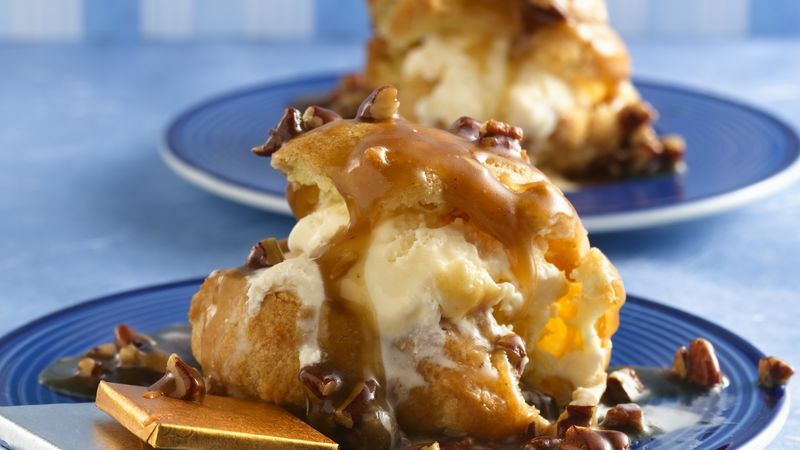 Cream puffs may seem like a hard-to-make mystery. Reality check--super easy! No special ingredients or equipment required--just flour, water, butter, salt and eggs along with a spoon and saucepan.